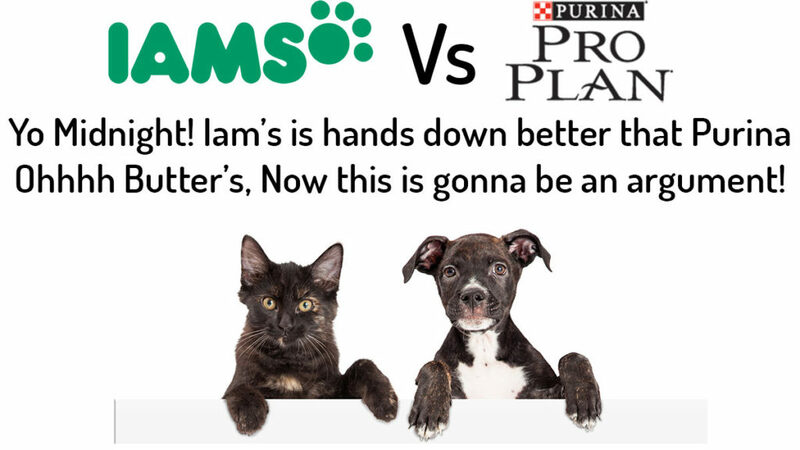 Iams vs Purina Pro Plan 2019 : Which pet food Brand gets Fur-st place? Quality nutrition is a vital item on every pet care itinerary, therefore, if you want your furry friend to remain happy and agile then the food you provide for your dogs and cats must be very healthful and desirous. Before deciding what brand of pet food to introduce into your pet’s feeding plan, you might want to consider the breed, age and size of the dog and/or cat as this will help guide your choice and purchase. By the end of this article you would have learn everything you need to know about your pet’s nutrition and how to make the best pet food choice for your furry friend. Now you’ve established the features and characteristics of your dog and/or cat, let’s see which of these two pet food brand, Iams or Purina Pro Plan, will best suit your pet. Which brand has more protein? Purina Pro Plan has 4.39% more protein than what Iams offers for dry dog foods and 5.30% more protein than Iams for wet dog foods. Purina Pro Plan dry cat foods has 9.47% more protein than Iams, also, 1.0% more protein than Iams for wet feline foods. whereas Iams still offers adequate protein content for pets daily needs. It is safe to say that Purina Pro Plan has more protein than Iams across all foods types. The Purina Pro Plan brand is more expensive than the Iams brand across all meal type while still regarded as an affordable brand. Which brand has more flavor? Purina Pro plan brand has more flavors than the Iams brand. It dominates with an aggregate of 165 flavors while the Iams brand has 85 flavors for both dogs and cats. Which brand has had more recalls? Purina Pro Plan has had recalls just once whereas Iams has been recalled twice. check out the current prices, recipes, and flavors for Iams and Purina pro plan. Both brands offer quite a number of dry and wet foods as well as treats for both dogs and cats, however, the Iams brand does not have any treat for our canine friends but we can always make that up with the treat Purina Pro Plan offers. Are you choosing your pet’s foods based on quantity or quality? Do the products of your brand choice meet your pet’s standard nutritional requirement? In feeding our dogs and cats, we should be more concerned with quality much more than quantity. The quality of our pet’s foods is expressed by the nutritional content of the food. To get a better understanding of what the nutrients of your favorite brand offers, do a proper examination of the product label. The label contains the different types of nutrients and their amount as well as the feeding amounts and schedules specific to different age, size and breed of dogs and cats respectively. Protein, fat, fiber and moisture are vital and compulsory nutritional requirement for every pet food. The amounts of these nutrients vary depending on the brand and product, so let’s see what Purina Pro Plan and Iams guarantee. Proteins are made up of amino acids. Some of these amino acids cannot be synthesized by our dogs and cats, therefore, they must be gotten from the protein-based foods they consume. Some of our pet may have physiological conditions which may require specific nutritional content in various amounts. For example, some of our furry friends may require more protein than others, especially during, gestation and lactation which require more protein intake than routine exercises. Carnivores tend to avoid food types that are deficient in essential amino acids so much that they would rather give in to a vegan diet that contains enough protein and vitamin D supplements. About 30-35% of the protein dogs and cats consume are used to maintain skin and coat health. The growth of kittens and puppies, waste elimination and hemoglobin synthesis in dogs and cats will be hampered if they are feed with protein deficient meals. Be it plant or animal-based protein, Purina Pro Plan and Iams use high quality protein in varying amounts as required by their different recipe formulations. As far as protein content goes, Purina Pro Plan is seen to dominate on both cat and dog foods. Fatty acids are the main constituent of fats. Like amino acids in protein, some essential fatty acids cannot be synthesized by the carnivores, thus, they are readily available in the fat-based foods consumed by our dogs and cats. Fats are considered unhealthy by some experts but for dogs and cats, it is a major source of energy. In fact, the energy provided by fats alone is more than twice the energy gotten from protein and carbohydrate combined. Nutritionally, fats provide the necessary environment for absorption of fat-soluble vitamins in the gut of companion animals. They also play a role in the maintenance of a healthy skin and coat of our dogs and cats, help in building a strong immune system and reproductive function, ensures proper cell functioning and structuring, and, aids in the retention of water in the body of our pets. Not only does fats play important roles in the nutrition of cats and dogs, it also improves the taste and texture of our pet foods products. Purina Pro Plan and Iams are two great brands with excellent amounts of protein, however, Purina Pro Plan dry and wet dog food guarantees more fats than Iams whereas Iams cat foods offer more fat than Purina Pro Plan. Like every other companion animal, dogs and cats need varying amounts of fibre at different stages of life for effective gut transit. The basic function and benefit of fibre in dogs and cats’ diet is to increase bulk and water in their intestinal contents, maintain adequate levels of good bacteria and enhance gut health. As fibres are not essential nutrients for cats and dogs, they cannot develop a deficiency. However, the presence of fiber above prescribed quantities in our pets’ body system could lead to weight loss but at the same time aid in regulating hyperglycemia, diabetes mellitus, diarrhoea and constipation as well as improve gastrointestinal functioning. Dog foods with high amount of starch, such as rice, have less fiber content while wheat bran products are relatively high in fiber. The fiber content of our pets’ foods could be lower or higher depending on the vet’s prescription so it’s important to consult them at all time for your pet’s nutrition. There is a slight difference in the fiber content of both brands as Purina Pro Plan food dominates across all food types especially in wet cat foods where it guarantees about 8.0% more fibre than what Iams offers. Pet owners on a budget could easily get exhausted when it comes to picking the food that is just right for their furry companions. The price of cat and dog food is one thing we all think about and take into consideration when planning our pet care system. With so many brand options and pet food vendors populating the food market, tracking down the prices of your pet’s food becomes tricky and confusing. However, devoting some quality time to gather good information (as provided in this article) and restructuring the budget of your pet care because of the food and treat of choice will not be such a bad idea as we want the best for cats and dogs. To better understand pet food comparison, see the table below for the different price metrics for Purina Pro Plan and Iams. It is more accurate to use the average cost-per-kcal metrics when comparing the prices of pet foods if your interest is on the dry matter of the food product. However, if you are also interested in knowing the cost of both the dry matter and moisture of the food content then, the average cost-per-lb metrics will suit your need perfectly. The Purina Pro Plan brand seems to be more expensive than the Iams brand but the difference in price is not so much. In addition, both brands offer 100% money back guarantee for all their products if positive results are not seen immediately. So where is the best place to purchase these brands? Good question! Overall, Chewy.com has the cheapest price. Both brands provide wet and dry dog and cat foods as well as treats for all pet sizes, breeds and activity levels but the Iams brand offer no treat for dogs. Purina Pro Plan offers great dog and cat food products. The primary protein content of this brand is chicken while the primary carbohydrate content is rice without any unnecessary fillers. The Purina Pro Plan brand uses simple yet high quality chicken, brewers rice, poultry by-product meal, whole grain corn, corn gluten meal, ground wheat, animal digest, garlic powder, soybean flour, soybean hulls, corn germ meal, dried corn syrup, whole grain corn, whole grain wheat, poultry by-products, soybean protein concentrate, vitamins and minerals. Every ingredient Purina Pro Plan uses is purposefully added to deliver quality nutrition and flavor that makes every bit irresistible. The Iams brand prides itself on providing outstanding nutritional formulas to our dogs and cats. Iams offer several variants to accommodate regular and specific dietary pet needs. The brand formulates its recipes using several premium quality chicken and chicken by-product meal, sorghum, Chicken Fat Preserved with Mixed Tocopherols, whole grain corn caramels, carrots, spinach, beet pulp, corn grits, fish digests, oatmeal and tomato pomace. Other ingredients include canola meal and oil, pea protein, brewers rice, wheat gluten, caramel color, vegetable oil, poultry giblets, corn gluten meal, dry meat by-products, ground yellow corn, powdered cellulose, animal fat, poultry by-product meal, dry apple and blueberry pomace, soybean vitamins and minerals. All these ingredients are combined in different proportions to give the delicious variant offered by this brand. Purina Pro Plan is a well-crafted brand that manufactures dog and cat food products. The brand is owned by Nestle Purina PetCare who manufactures other popular brands of pet food like Purina One and Purina Dog Chow. The brand was established when Nestle acquired Ralston Purina in 2001 but William H. Danforth, who was the original owner, has been producing quality pet food since 1894 under the name Purina Mills. The brand is famous for its product specificity and pet chows ranging from the Purina Dog chow, Purina Cat chow and Purina Horse chow. Purina Pro Plan offers both dry and wet food as well as treats to pet owners and their product line grouped into Savor – a combination of outstanding nutrition and taste for your pets daily living, Focus – formulated to meet the needs of dogs and cats of varying size, age and specific needs, Sport – designed specifically for pets involved in sporting activities or pets with active lives, and Bright Mind – made up of various ingredients that stimulates brain functions. The Iams brand has been around since 1946 when it was founded by Paul F. Iams whose beliefs and philosophy drove to pet food brand till it became a premier brand. The brand’s goal and driving force has been and still is the need to provide pets with wholesome, delicious and nutritious diet affordable to every pet owner. The Iams brand manufactures dogs and cat foods amongst other companion animals and it is owned by Spectrum Brands in Europe and Mars Incorporation, Worldwide. This brand was the first to introduce age specific dog and cat food. Iams has three parent formulas, they are ProActive Health, Healthy Naturals and Premium Protection. Products from this brand include Proactive Health Adult Minichunks, Proactive Health Indoor weight & Hairball Care for Adult Cats, Healthy Naturals Adult Weight Management with Chicken and Sensitive Naturals Adult ocean fish and Rice Recipes. Although both brands are unique in their own ways, Purina Pro Plan is the brand of choice based on nutritional value, number of recalls and number of variants. However, if you are on a strict budget, Iams will be a more affordable brand for your pets.